The Diocese of Palai came into existence bifurcating the Diocese of Changanacherry on 25th July 1950. Mar Mathew Kavukattu and Mar Sebastian Vayalil were appointed as the Bishops of Changanacherry and Palai. Clarist Congregation working as a unit in the Diocese of Changanacherry was also divided and two separate units came into existence that is Changanacherry and Pala. The General chapter held on 7th April 1952 under the leadership of Changanacherry and Palai Bishops elected Mother generals for the separate units. 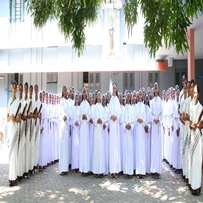 Mother Mary Ursula Karottuveettil was elected as the First Mother General of the Clarist Congregation of the Diocese of Palai. There were 16 convents and 392 members for the Palai units. After II Vatican Council , units of Congregations of the same Charism started unification processes. Mother Mary Leo , Mother General of the Clarist Congregation of Pala took initiative for the unification of the congregations different diocesian units in 1969. In 1970 the unification was done and the name of the Palai unit became Franciscan Clarist Congregation , Alphonsa Province Pala and Rev. Mother Pius was elected as the first Provincial Superior . In 1966 sisters were sent to North-east, in 1971 to Ujjain, in 1972 to Punjab. When the number of sisters became 946, in 1989 Pala was divided into two provinces and on 18th April 1989 Bharananganam Province was formed from Pala Province. Sisters were sent to Germany in 1992 for Punjab and Ujjain Missions came under Pala Province. St. Francis Province Jalandhar was erected combining the above two missions on 1st January 2004. In 2007, Meghalaya Mission was started by sending sisters to Mawlangdep in the Diocese of Nongstoin, Meghalaya. After the canonization of St. Alphonsa, 'the Muricken House' where St. Alphonsa spent her early life, was bought by the province in 2009 and St. Alphonsa Bhavan came into existence at Muttuchira. Sisters started working in the home for aged at Angona, Italy in January 2009. Shambyu Mission in Namibia, Africa was started in the Vicariate of Rundu on 8th October2013, by sending four sisters. At present the province has 417 members and 35 convents.